– Bugala Farmers’ Association opposes Bidco Africa’s membership of the Business Call to Action hosted by UNDP. The firm joined the call committing to create 60,000 jobs across the region by 2019. 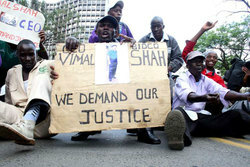 – The petition cites Bidco Africa’s failure to comply with court orders to compensate farmers for their land; and the company’s labour practices in East Africa. Ugandan farmers want the United Nations Development Programme (UNDP) to cut ties with Kenya’s Bidco and investigate it for alleged malpractices against Ugandan, Kenyan and Tanzanian growers. Bugala Farmers’ Association opposes Bidco Africa’s membership of the Business Call to Action (BCtA) hosted by UNDP. The firm joined the call committing to create 60,000 jobs across the region by 2019.